Palace of Darul Aman, dwelling of peace or, in a double meaning "Aman's abode is a ruined palace located about sixteen kilometers (ten miles) southwest, outside the center of Kabul, Afghanistan. Progress has been made on an important project to completely renovate the building by 2019. The construction of the Darul Aman Palace began in the early 1920s as part of King Amanullah Khan's efforts to modernize Afghanistan. capital called Darulaman, connected to Kabul by a narrow-gauge railway The palace is considered a testament to the friendship between Afghanistan and Germany, as it was designed by the German engineer Walter Harten and his team of engineers. Neoclassical building on a hill overlooking a flat, dusty valley in the western part of the Afghan capital, designed by French and German architects, it was one of the first buildings in the country to get central heating and running water. Intended as the site of a future parliament, the building remained unused and partially completed for many years after the religious conservatives under Habibullah Kalakani forced Amanullah from power in 1929, and halted its reforms. In later years he served as a medical school for the University of Kabul, as well as a warehouse and home to several smaller ministries. The building was destroyed by fire on December 14, 1968 and subsequently restored to house the Ministry of Defense in the 70s and 80s. In the 1978 communist coup, the building was once again set on fire. Much of the building was damaged by the fire of tanks during the failed coup of Shahnawaz Tanai on March 6, 1990. It was again damaged in the 1990s when rival Mujahideen factions fought for control of Kabul. 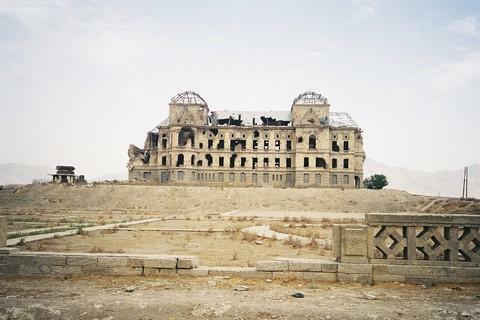 The heavy bombardment of the Mujahideen left the palace in ruins and were used mainly as a settlement of refugees and nomad camps until the early 2000s, when it became a headquarters of the battalion for the Afghan national army. In 2005, a plan was launched to renovate the building to be used as the headquarters of the future parliament of Afghanistan. It had to be financed mainly by private donations of foreigners and wealthy Afghans. The palace is one of several objectives of a series of attacks launched on April 15, 2012, for which the Taliban have claimed responsibility. In the end it was decided to develop a new building in front of the building to house the parliament, with Indian help. Construction was completed in 2015. Work began on a $ 20 million restoration project in early 2016 to renovate the building in time for the centenary of Afghanistan's full independence in 1919. Nearly 600 tons debris was initially removed from the 150-room building and from spring 2017, workers were removing plaster and cement from the interior walls. Over 80 engineers and architects are involved in the project, of which 25% are women. In February 2018 it was announced that almost 50 percent of the renovation was complete.